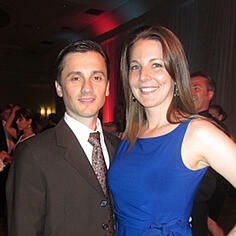 Lucian and Sarah Stanila are the owners of these 5 North Jersey studios. They are honored to be a part of the Arthur Murray legacy and look forward to keeping it going for the next 100 years! They have been dancing all their lives and teaching professionally with Arthur Murray Dance Studios for over 15 years. In addition to their New Jersey locations, they have recently opened the first Arthur Murray Dance Studio in Bucharest, Romania; where Lucian is from. They have won many top instructor and management awards including the prestigious Studio of the Year award given by Arthur Murray International. They strive for an excellent learning environment filled with lots of fun, laughter and great dancing!